While films had been made outside of studios for some time, Open City seems to embody the ethos of a movement—one that began as “Italian Neorealism” and has grown into an international phenomenon that continues to this day. Francois Truffaut, Jean-Luc Godard, Morris Engel, the Iranian New Wave, American Film Noir, John Cassavetes… really, the list goes on and on. Rossellini liberated cinema from the hands of the privileged few and empowered the “little” people to stand up and speak out. He broke down the confining walls of the studio and turned the camera on the world. We all owe a great debt to this one film and its maker. But there’s also a larger debt that has gone unpaid for far too long, which is that Rossellini embodied a far more important concept of an “independent filmmaker” that went beyond topics and aesthetics. He resisted labels and refused to be tied down to a single style. Yet the farther he moved away from the particularities of his earlier work, the more the world rejected Rossellini. He made a certain kind of movie, and that’s what they expected and, more importantly, understood. Such is the dilemma all artists face when they grow and change. In a time in which independent cinema is (once again) threatened by corporate facsimiles of an “indie” style, and critics use labels to carelessly pigeonhole films (is The Pleasure of Being Robbed really “mumblecore”? ), it’s important to look back on this foundational filmmaker and consider that he faced the same problems that our contemporary filmmakers do. Rossellini made only two more “Neorealist” films—Paisan (1946) and Germany Year Zero (1948)—before embarking on a richly diverse career that has proven problematic and unpopular to viewers and critics for over half a century because of their non-conformist nature. 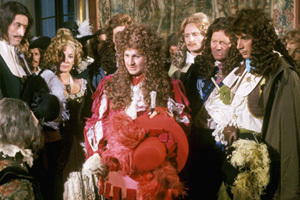 The apex of this controversy are his historical films made for television: The Taking of Power by Louis XIV (1966), just out on DVD from the Criterion Collection, as well as The Age of the Medici (1972), Blaise Pascal (1972), and Cartesius (1974), which are available in a box-set by Criterion’s off-shoot label, Eclipse (packaged as Eclipse Series 14: Rossellini’s History Films—Renaissance and Enlightenment). On the surface, they are a world apart from his early work, lacking not only the immediacy of current politics, the bombed out streets of Rome, and the intense spiritual connection with the characters, but also the stirring drama of war. But once one moves beyond the obvious, the connections are all too clear: real locations are still being used, as are non-actors, and instead of the stiff formality of most historical epics, these films are decidedly naturalistic. And the dialogue of the characters is certainly rife with politics, spirituality, and especially art. Firmly believing that “Neorealism” is more of a moral viewpoint than visual aesthetic, Rossellini engages in history the same way he does the present day. He is fascinated with the cultural forces at work, the pressures that people face, and the conditions that influence their actions: politics, religion, art, science, and commerce. He isn’t so much interested in dramatizing history as in empathizing with it. The scripts are like Socratic dialogues: refusing a reductive, hegemonic point of view, Rossellini allows characters to digress away from action and debate contrary opinions. The magnificent opening scene of the four-part The Age of the Medici is characteristic of this approach. At the funeral for the elder Medici, a crowd has gathered to pay their respects and air their grievances: friends and enemies, family and strangers, the wealthy and the impoverished, the voices and opinions all coalesce in a cacophony of contradiction. It’s as if he’s more interested in the why than the what of history, as opposed to most movies, which are content to use the past as conveniently pre-destined plot points for whatever love-story or action-epic they are working on. So many “historical” films seem even deader than the characters actually are in real life, but Rossellini makes these stories more alive—and more relevant—than ever before. Part of the vibrancy of these films is that the characters don’t come off as ancient figures, but living and breathing humans like you or I. Just as in his earlier The Flowers of St. Francis (1950), Rossellini removes sacrosanct icons from their high shelf and brings them down to earth. In The Taking of Power by Louis XIV, we are shown not the majestic rise of a young king but the humdrum minutiae of “being” in command. For most of the film, everyone seems to be bored, especially the King. At first they are waiting for the cardinal to die; later, Louis XIV’s rivals are biding their time for him to screw up or get tired of his new role; meanwhile, the King himself is still trying to comprehend the performance required of him. The dinner ceremony, in particular, is a masterpiece of bored regality: the servants behind-the-scenes are busy preparing the food, while the King himself seems as aloof and disinterested as the rest of the court. Rossellini doesn’t seem to be making a subversive statement about royalty so much as he is allowing this larger-than-life figure to be human. No less an artist than Francois Truffaut told Rossellini that he was wasting his time with these movies. While I can understand that these are certainly unconventional films, I find it hard to believe that Rossellini’s expressive eye for detail has gone overlooked for so long. 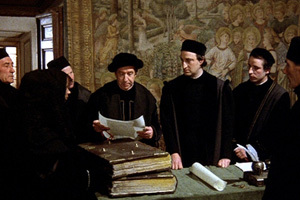 In The Age of Medici, Cosimo de Medici’s discussions of economics and politics, and Leon Batistia Alberti’s lengthy discussion of aesthetics and science, are among the most sustained and invigorating intellectual conversations ever put to film, not to mention the digressions into Donatello’s studio or the arguments about Ghiberti and Brunelleschi. They don’t seek to “entertain” us, and as much as Rossellini admitted these were didactic films, I don’t think their main purpose is merely “educational” either. So many of the conversations are timeless—such as the many discussions about war profiteering in The Age of the Medici or the taxation of the lower-classes in The Taking of Power by Louis XIV—and this is where I think the real value of these films lies. Not merely in the pageantry of the past, but in analyzing the foundational issues of society which continue to plague us today. Rossellini is not just showing us history, but allowing us to think and feel it. It would be too easy to say that Rossellini was ahead of his time with these films, when really it is that his conception of cinema was so much richer, deeper, and more meaningful, than our own. We still haven’t caught up with Rossellini yet, but hopefully Criterion’s new DVDs will help bring us closer.